Molds are a naturally occurring and necessary part of our environment. Various types of outdoor molds break down dead organic matter, such as fallen leaves, dead plant life and dead or decaying trees. Some indoor molds, however, can be hazardous to humans and even pets. Steps should be taken to quickly remove indoor mold, since, if left untreated, it will continue to grow and spread throughout the home. Molds reproduce through tiny seed-like spores that float through the air. When the airborne spores, which are invisible to the naked eye, land and come into contact with moisture, mold begins to grow. Although there are many types of mold, none will grow without dampness or moisture. The key to controlling indoor mold is controlling moisture inside the house. Indoor mold growth usually isn’t a problem, unless the airborne spores come into contact with moisture, such as landing on a damp surface. Because some molds produce allergens, they can cause allergic reactions in humans when inhaled or touched. These reactions typically include sneezing, red eyes, runny nose and skin rashes. Other reactions to mold are watery eyes and irritations of the throat, nasal passages and lungs. Mold can also trigger attacks in people with asthma. There are some molds that produce highly toxic mycotoxins, which can result in upper respiratory tract discomfort such as headaches, coughing and wheezing. Sometimes there are also neurological symptoms, including shortened attention span, difficulty concentrating, dizziness and even memory loss. 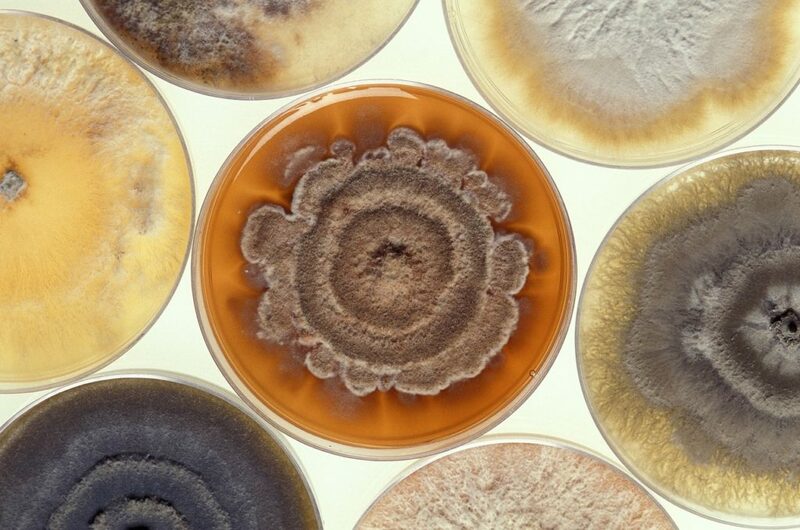 Aspergillus is a type of mold often found on food and in air conditioning systems, and can do minor damage if inhaled. Some of the more severe effects of Aspergillus mold are allergic reactions, respiratory tract infections and inflamed lungs. Cladosporium is a pepper-like substance that’s typically black or green in color. It’s often found growing on the back of toilets, glossy painted surfaces and in fiberglass ductwork. It’s also found in damp carpeting, floorboards and drapery, fabrics or upholstery dampened by accidental spills or through windows left open during a rainstorm. Although it’s nontoxic, it can cause red, watery eyes, sore throats, rashes and breathing problems. Stachybotrys atra or Stachybotrys chartarum is also called “black mold.” It’s a highly toxic mold that creates mycotoxins , which are compounds that, if inhaled, can result in severe breathing problems, sinus infections, asthma attacks, depression, fatigue and more. Black mold has a musty smell, and grows in dark, damp areas and air conditioning ducts. Trichoderma is another mold found in moist areas, such as damp carpeting or behind wallpaper. The toxins produced by trichoderma can trigger allergic reactions, sinus infections and other respiratory problems. Penicillium mold is found in wall and ceiling insulation, damp carpeting and drapes, water damaged furnishings and other moist areas. Penicillium mold can spread quickly throughout the home, and is known to cause inflammation of the lungs, sinus infections and similar allergic reactions. If a person’s allergic reactions or toxic symptoms worsen when inside a home or building, chances are there’s mold growing there. If left unattended, the mold will spread and become a much bigger problem. Even a small amount of mold is an indication that the conditions inside the house are conducive to growing mold. Measures should be taken as soon as possible to clear and disinfect the affected area to prevent it from spreading. Water and Moisture. If there’s been flooding, overflowing or other incidents involving water in the past, chances are good that mold is already growing inside the house. Ongoing problems with moisture or an accumulation of water beneath sinks, around drains or elsewhere inside the home will inevitably lead to mold growth if left untreated. Allergy Symptoms. If you’ve recently developed allergy symptoms or if you’re already an allergy sufferer and your sneezing, watery eyes and congestion have worsened, it could be due to mold growing inside your home. This is particularly true if your symptoms are worse when you’re at home, but seem to improve when you’re away. Moldy Smell. A moldy odor indoors is sometimes the only indication that there’s mold growing somewhere inside the house, even if you can’t see it. Don’t ignore it. Thoroughly inspect the house and locate the mold before it spreads and the problem worsens. Condensation. Molds thrive under warm, moist conditions. If you see beads of condensation on windows or metal pipes, it indicates a high level of indoor moisture. That’s a sign there could be a mold problem where condensation accumulates. Visible Signs of Mold. It’s easy to overlook small amounts of mold or mistake them for dirt or soot. Even if the affected area is slight, it’s advisable to take remedial measures immediately. Tiny patches of mold can quickly spread, and their mere presence means conditions are conducive for mold to flourish and spread. Although it’s impossible to entirely eradicate indoor mold and mold spores, the spores won’t grow if there’s no moisture. The key to preventing and controlling mold is not just removing the mold and disinfecting the area, but also controlling the moisture inside the home. Sometimes this is as simple as repairing a leaky pipe or removing damp carpeting and padding. In warm, damp climates, a dehumidifier might be needed to alleviate the situation and prevent further growth. Inspection Certification Associates, the country’s foremost provider of home inspector training, offers a Mold Inspection Course. Typically valued at $100, our Mold Inspection Course is included free of charge with our Home Inspection Training Course. Contact us via our contact form or by calling 888-374-4096 today to learn more about getting certified for home inspections or to purchase our Mold Inspection Course for your home inspection business needs. The post All About Mold appeared first on Home Inspection Training & Certification Online.